In 1992, “Andre 3000” Benjamin and Antwon “Big Boi” Patton formed OutKast in Atlanta Georgia. In 2003, the hip hop duo released their fifth album, Speakerboxxx/The Love Below. The album marks a turning point for the dynamic hip hop duo because it is composed of 39 full-length tracks that are stylistically very different their earlier material. The product of their 2003 efforts is a blend of jazz, funk, and pop, which is accompanied by live instruments and singing. In 2004, Speakerboxxx/The Love Below won two Grammy Awards: Album of the Year and Best Rap Album. It also won the American Music Award for Favorite Rap/Hip-Hop Album in 2004. A member of Big Boi’s crew wears black chucks while playing dice with his friends. The tenth track on The Love Below is “Roses,” which was produced by Andre 3000 and Dojo5. The video begins with an unknown person flipping through Stankonia High School yearbook (“Stankonia” is the name of OutKast’s fourth album, which was released in 2000). The person flips to a page that reads “Biggest Flirt” and contains a photo of Caroline Jones. The video flashes back to Valentine’s Day at Stankonia High School. Big Boi and his friends are playing dice on the sidewalk and one of them is wearing black chucks. Then, the video cuts to the ladies’ restroom at Stankonia High. Caroline and her posse are strut out of the restroom with confidence. The students of Stankonia High School file into the school’s auditorium and wait for a performance to begin. As the song begins, the curtain opens and we see Andre 3000 and his crew on stage. Wearing black chucks, they are tapping their feet and snapping their fingers to the introduction of “Roses,” which is played on the piano. Andre 3000 performs the song energetically and passionately. While the rest of the student body gets a kick out of the performance, Caroline is far from amused. The performance is clearly directed at Caroline; the first word of the song is “Caroline!” Being the subject of such a brutally honest, (condescending) and parodic song, Caroline is not happy. 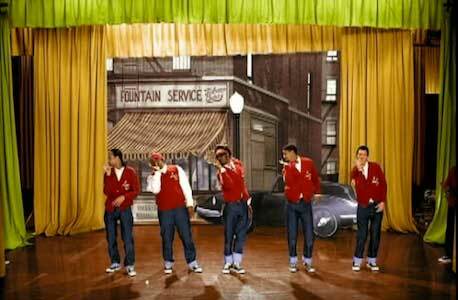 Andre and his crew tap their black chucks to the beat as they begin singing “Roses” to Caroline Jones. 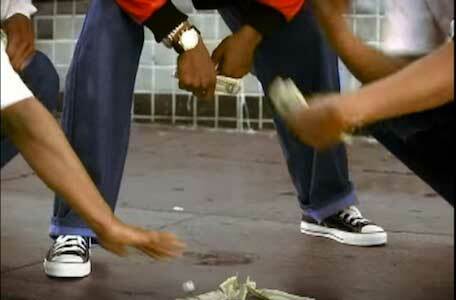 OutKast never explicitly mentions when the music video takes place. However, the costumes, props and abundant “West Side Story” references imply that it is set in the mid-1950s. 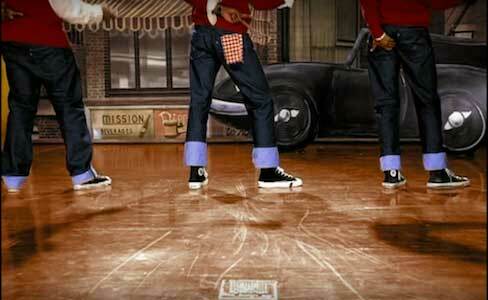 Andre 3000’s crew gives off gives off a “West Side Story,” vibe complete with cuffed denim and black chucks. The image below is not depicted in the official music video. 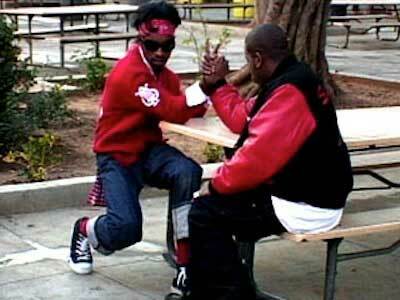 Andre 3000 is wearing his black chucks as he and Big Boi arm wrestle on the set of “Roses”.